The hospital design process becomes quite complex when accounting for multiple functions. Efficiency and utility are crucial when developing a hospital floor plan. Our healthcare Design-Build experts offer insight based on decades of experience building these facilities. With their expertise and guidance, your hospital floor plan development process will result in a facility that improves patient care and secures the financial success of your healthcare organization. View this infographic for a summary of the crucial aspects that come together to create an effective hospital floor plan. 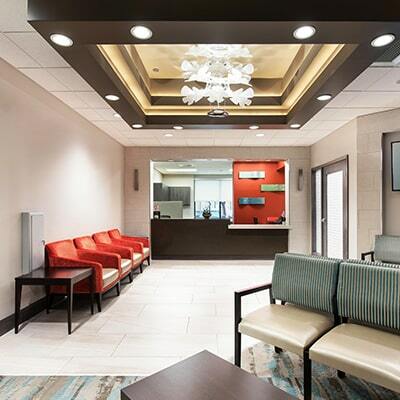 Our first Design-Build project was a long-term care facility we build in Highland, Illinois. Ever since we delivered that project back in 1963, developing hospital floor plans that help improve patient outcomes and let staff work more efficiently have been the cornerstone of our healthcare Design-Build services. Do you have questions about creating the optimal hospital floor plan? Let’s discuss it. And if you want more broad information about healthcare construction project management, consider downloading our start-to-finish guide on the subject.